For several years the location of a popular restaurant, this beautifully vaulted brickwork cellar a short walk across the canal from Old Riga has now metamorphosed into an Italian fine-dining ristorante with winemaking at its heart. Wander down the flight of steps into Ottella from the corner of J.Alunāna and O.Kalpaka, two streets in the city’s upscale embassy district, and the tables are laid out to the right as you walk in. A small gourmet food-and-wine shop, which can be perused while waiting for your meal or en route to the bathroom, is laid out close to the entrance. Ottella’s interior manages to exude a rustic ambiance, adorned with quaint wooden furniture and, on the walls, more black-and-white photographs of casks, winemaking and wine-snorting than you can count. The tabletops convey images of medieval maps of Italian and Sicilian towns. The wine-cellar theme is extended with displays of empty bottles upended in piles and framed arrangements of corks. An old meat-slicing machine has become another static part of the exhibition, and hand-painted dishware has been imported from Italy. Uniformed waiters rush about in a genuine effort to attend to everyone’s needs simultaneously. The clientele, many of them businessmen with girlfriends eyeing up other businessmen, but also chatty groups and pairs of female friends, devour salads, grills and pasta. Edith Piaf oozes gently from the speakers. Antipasti include a heavenly-smelling cheese platter (€11.30) featuring Parmigiano Reggiano aged 14 months, Grana Padano, Provolone piccante, and others. Also recommended are the charcoal-grilled red tuna slices with leek and black truffles (€7.20). We happened to stumble on one of the highlights of the menu – an excellent risotto with artichokes (€5.70) in a deep dish heavy with olive oil. Other risottos come with beef and vegetables, a prosciutto-and-mushroom sauce, or asparagus and sander fillet. Like Foody, Ottella also offers a fine, albeit pricier, grilled red tuna steak with pine nuts (€14) this time served with mashed potato. Crowning the menu, however, is something altogether more spectacular. 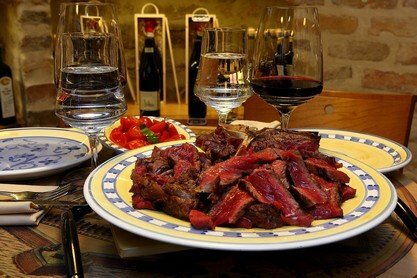 Bistecca alla Fiorentina, a Florentine version of the porterhouse steak priced at €4.30 per 100 grams, is a melt-in-the-mouth treat whose hardwood coal-grilled taste makes it a particular specialty of Italian cuisine. Chopped from a specimen of Tuscany’s Chianina breed of cattle, it’s a massive chunk of meat between 800 and 1,700 grams and up to four centimeters thick. 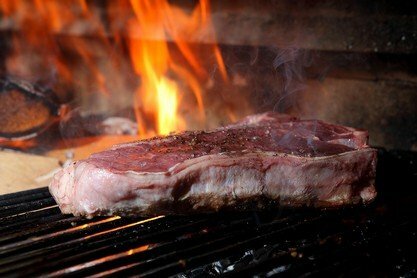 Grilled alternatives include a rack of lamb, veal, beef with artichokes, and ox entrecote, all priced at around €14. Families will be relieved to find “dishes for our little guests,” although not many kids will like the sound of rabbit sauce on their pelmeni. Overall, however, Ottella is an outstanding Italian restaurant.